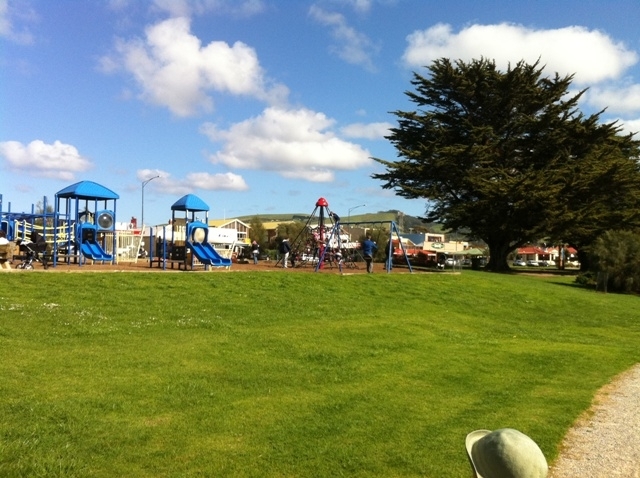 Start at the Apollo Bay tourist info then along the grass past the playground, golf course, Barham River around the ocean beach, past the harbour, along the beach and back to the skate park. 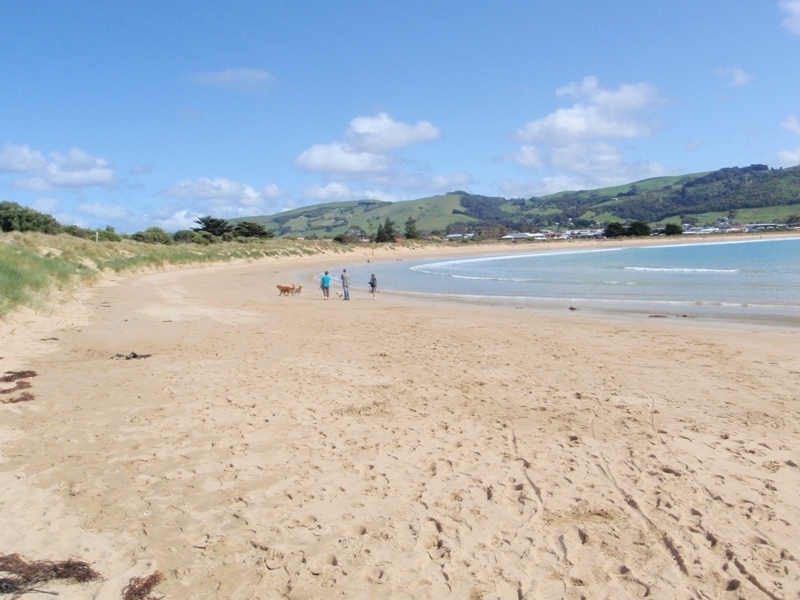 About 1,200 permanent residents live in Apollo Bay, but the population swells to 15,000 over the summer holidays. Whether it is the middle of winter or the peak of summer, walking is the best way to get around. 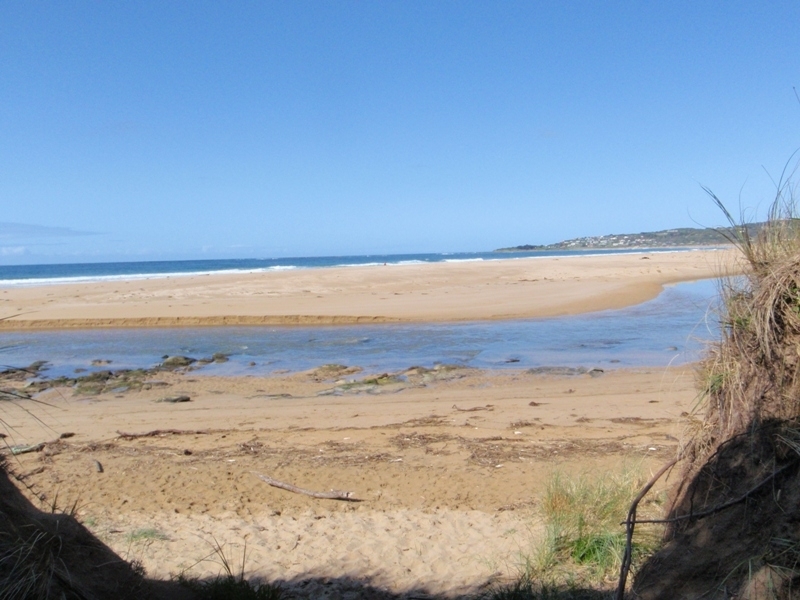 Although the surrounding hills are quite steep, the township and beaches leading to nearby towns of Marengo and Skenes Creek are relatively flat. The Gadubanud or Katabanut known to the Europeans as the King Parrot People are the traditional owners of the Apollo Bay area and much of the Otways. The Cape now Cape Otway was discovered by Europeans when Lieutenant James Grant surveyed the Victorian coast sailing the Lady Nelson in 1800. Several years after sealers and whalers worked in the region and the Henty Brothers whaling station was set up at Point Bunbury on the west end of the bay, the Apollo Bay Golf Course now stands on this land. The land was originally called Krambruk which was an Aboriginal word for Sandy Place, then around 1877 the Europeans renamed it to Middleton, twenty or so years later the name again changed the name to Apollo Bay after the schooner called Apollo sailed by Captain Loutit in 1845 which used the bay as a refuge on a trip between Melbourne and Warrnambool. There are plenty of things to look at wandering around. 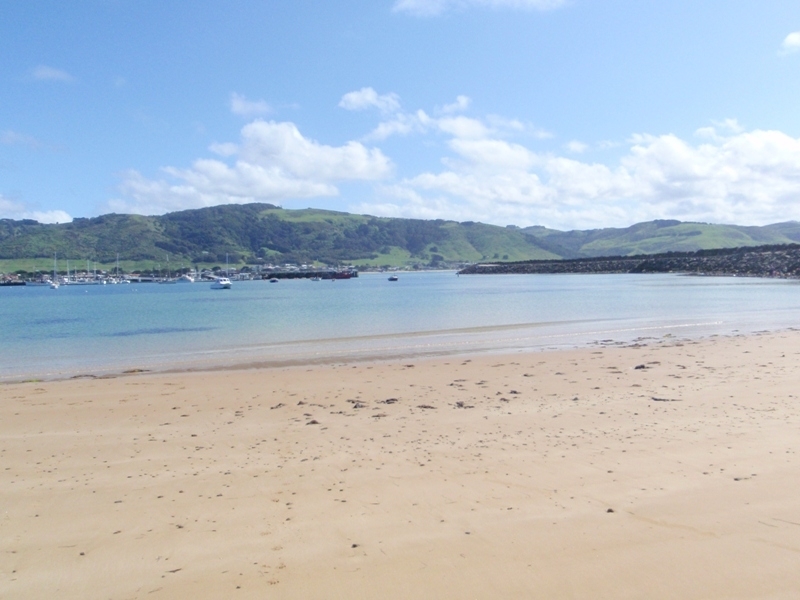 Apollo Bay?s harbour is one of only three safe blue water havens in Victoria west of Port Phillip Bay. It is presently home to the local fishing industry with a fleet of 11, employing 35 people and generating an annual catch of $6.5 million. 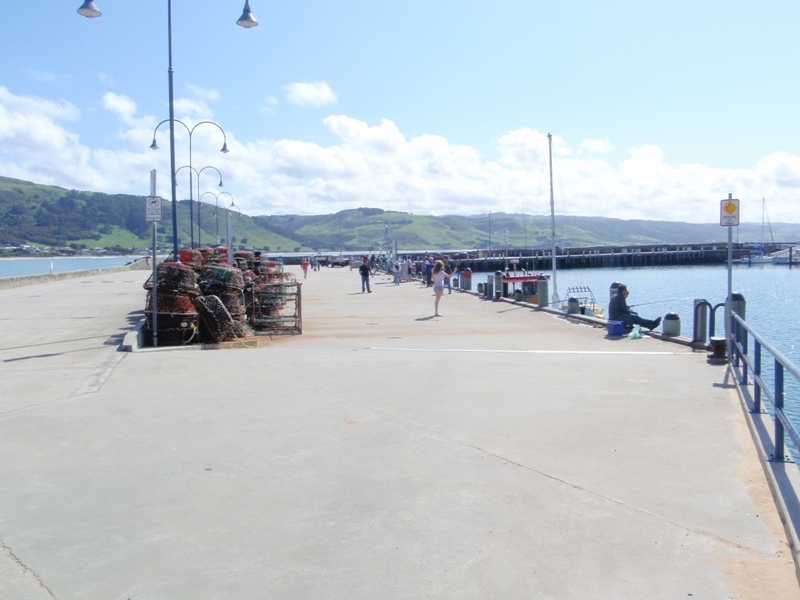 Lots of people fish off the harbour and breakwater so there always seems to be something going on. The surf beach has beautiful (but often cold) water and near the harbour is quite sheltered so it is very good swimming for younger children. 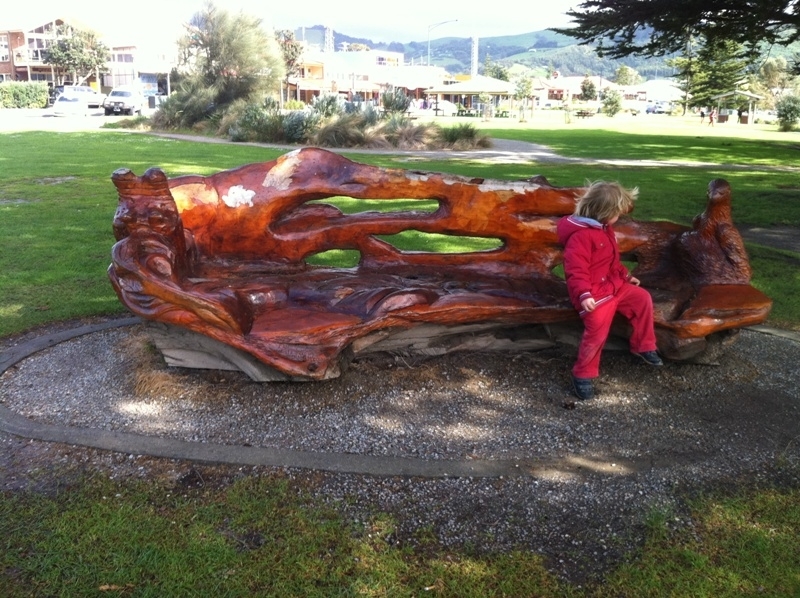 The large grassy area behind the sand dunes and across from the shops is great for picnics, has a playground, a skate park and many brilliant wooden sculptures with an oceanic theme. The tourist info is one of the best along the coast. 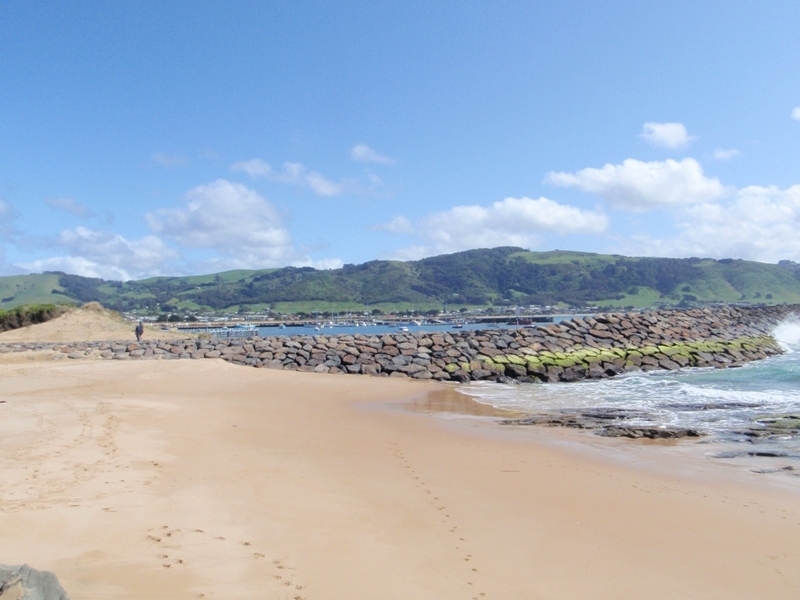 This walk takes in many of the sites around Apollo Bay and includes a walk along a little bit of beach looking onto the southern ocean and the mouth of the Barham River. You are likely to see an abundance of birdlife including crimson rosellas, herons, swallows, seagulls, pacific gulls, plovers, finches, terns and many more. I hope you like it! 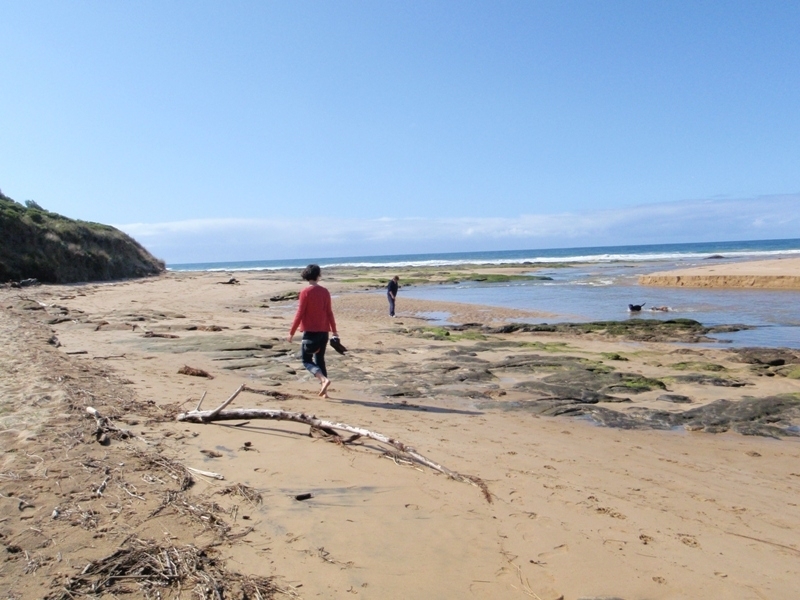 For the more adventurous, the famous Great Ocean Walk starts from Apollo Bay and goes to the 12 Apostles weaving through beautiful parks, deserted beaches and rugged coastline, but that is another story altogether. On a warm day, this is a great seat to sit and watch the world go by. There always seems to be children in this playground. 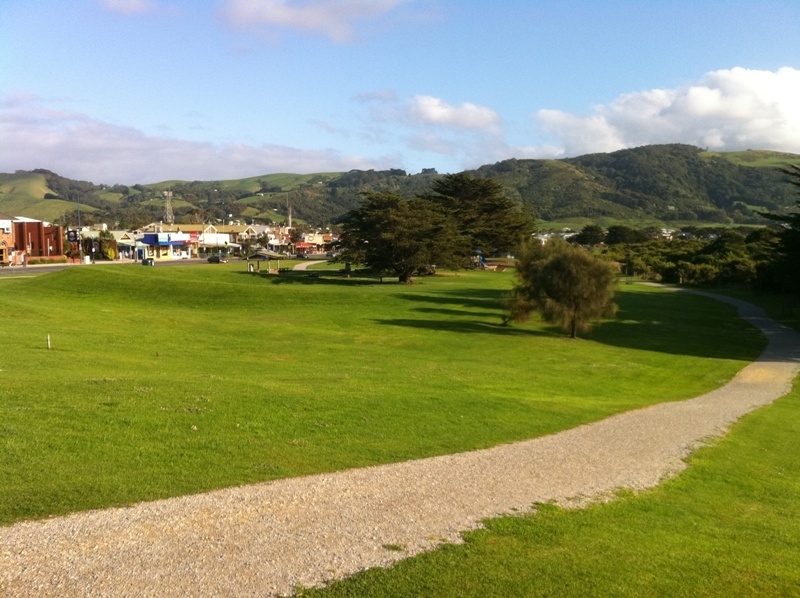 The path looking back to Apollo Bay township, the grassy knolls make wonderful slopes for rolling down. I love this part of the walk where you start to get inviting glimpses of the sea and start wondering what lies beyound the trees. Through the shady path and the Barham river appears, Marengo lies in the distance. Official dog off leash beach, there always seems to be dogs here. 7. 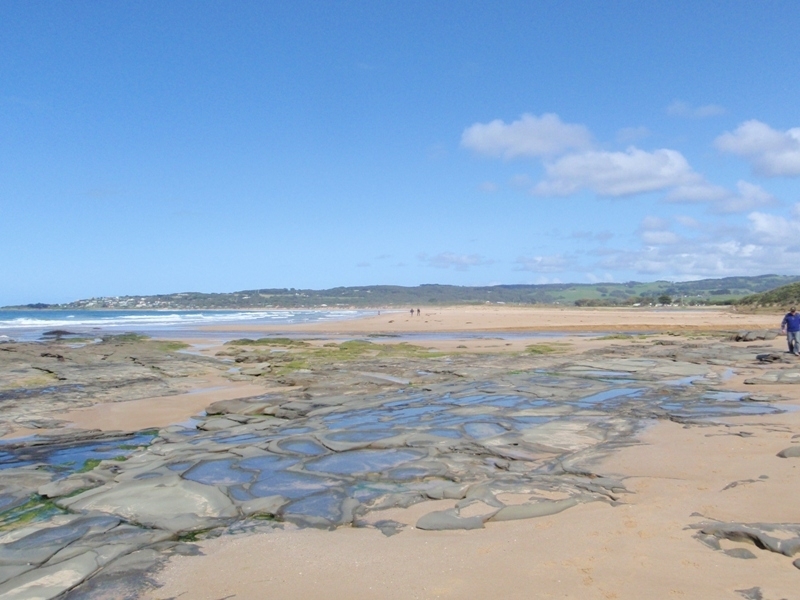 Expansive views and little rock pools. The ocean and sea breezes (sometimes gales!). The rock formations and great for hopping along and see things in the rock pools. 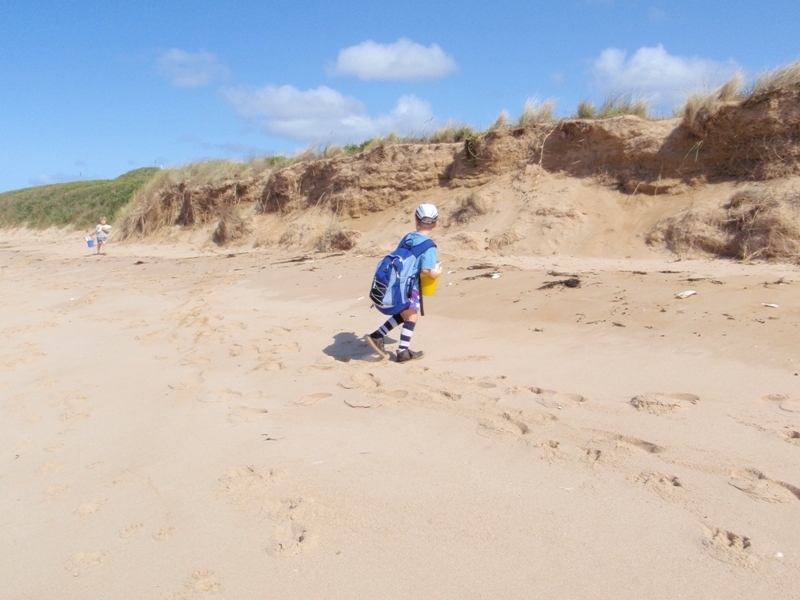 Lots of things to keep children interested, shells, birds, cuttlefish shells and general stuff to pick up and look at. The stonework on the breakwater is truly a work of art! Who can resist walking to the end of the breakwater? Great fishing spot too (caught a flathead there). Beautiful sheltered beach with crystal clear water. When we were there, two nesting Cape Barron Geese cmae hissing towards us. 12. Craypots, fishing boats and anglers. The piles of neatly stacked craypots and fishing boats in the water are really beautiful. The beach is most sheltered nearer the harbour and the swell gets bigger as you walk along the bay. 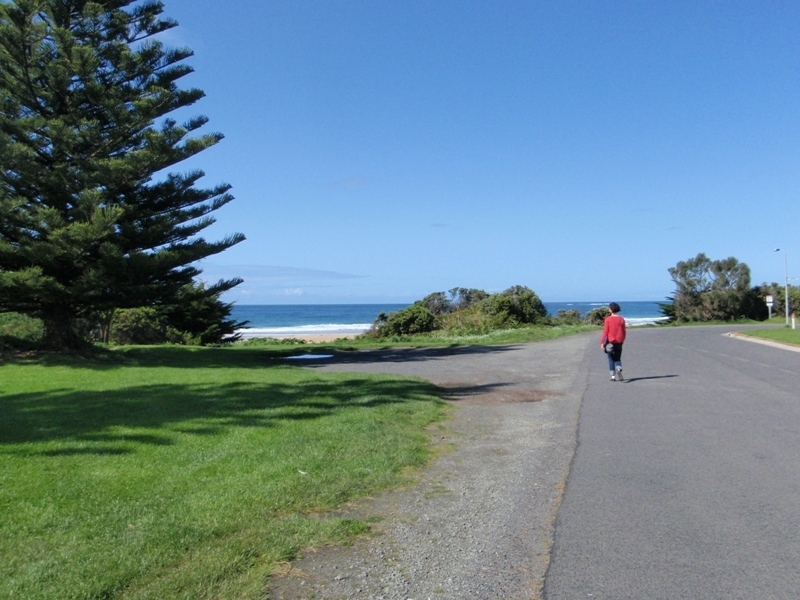 It is a great beach for swimming, body surfing, surfing and flying kites (it can get very windy). 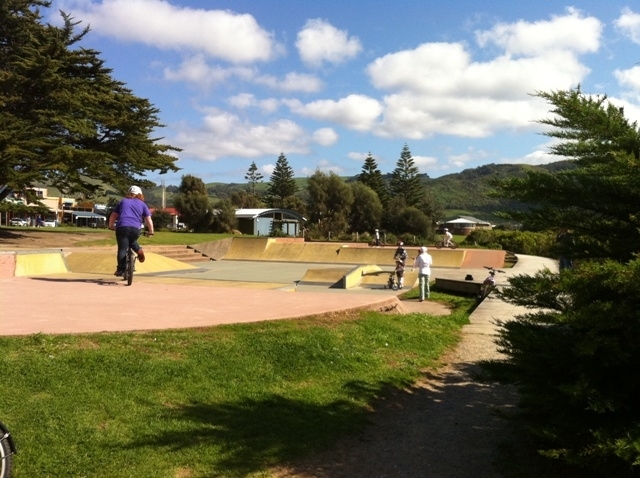 I love stopping and watching skaters, scooters and bike riders mucking around on the skate park. 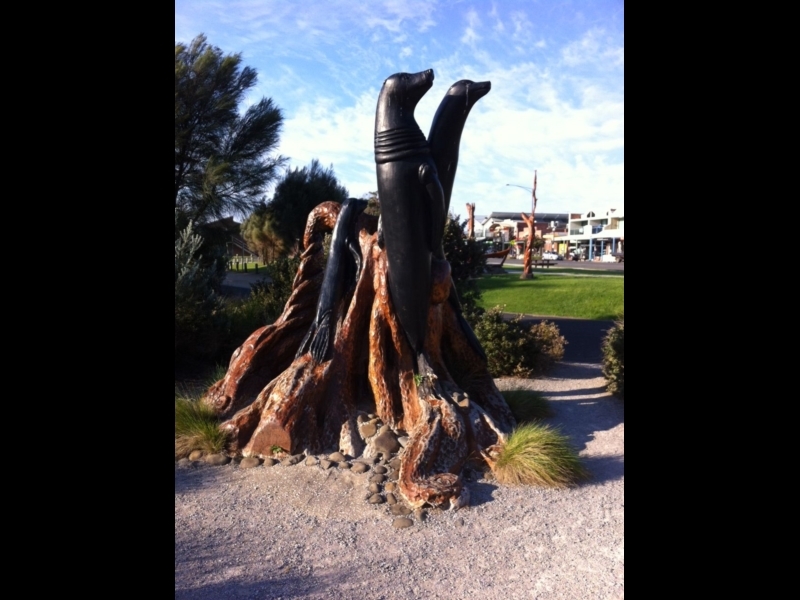 Next to the Tourist Info this is the first of many fantastic sculptures along the foreshore. 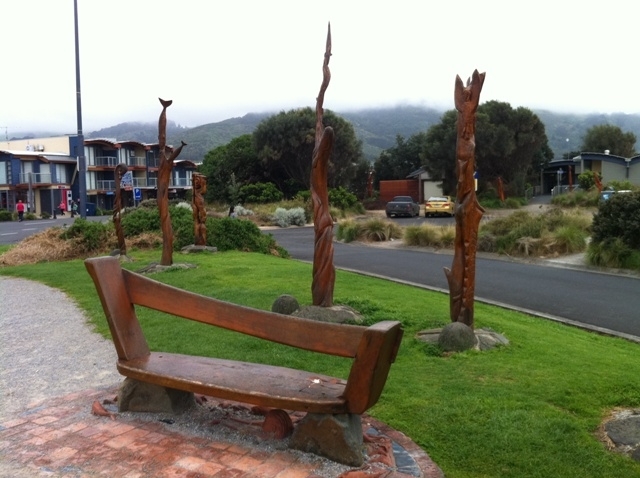 The grassy area across from the shops is a fantastic place to wander, stop, picnic and sit. If is also quite sheltered from southerly sea winds.